Kids love to get creative and they love to play with things that they make for themselves. 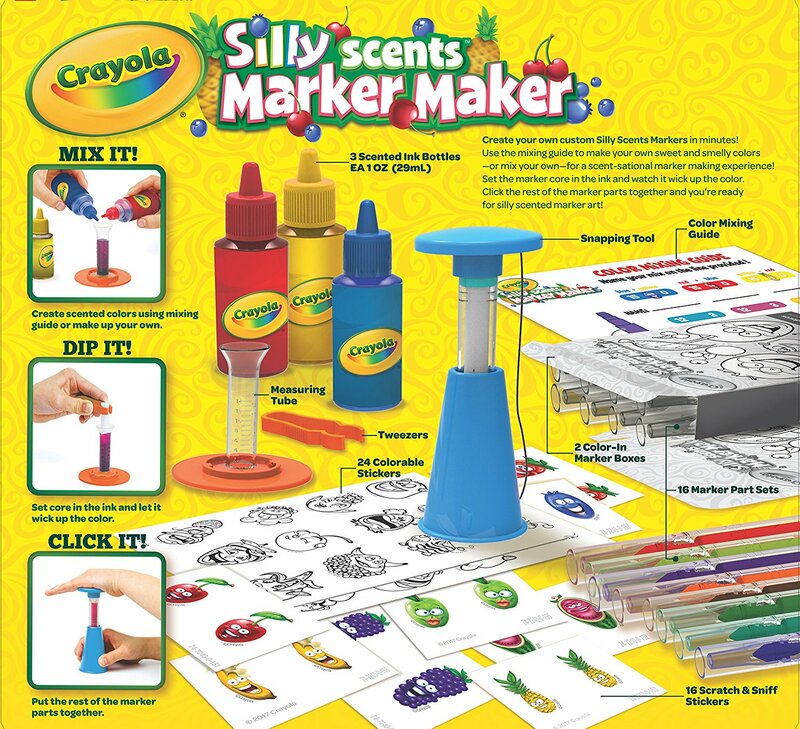 You can combine creativity with fun when you get the Silly Scents Marker Maker. This amazing toy allows kids of any age to be able to explore their creative side by playing around with different colors and scents. This lets them create a marker that’s uniquely their own. They can make any combination of colors and scents to find one that they love and they’ll get hours of fun play out of the finished product. The set has a color mixing guide that kids can follow along with. This will help younger kids learn how to mix colors to create a new color. Plus, this can help teach kids to avoid mixing too many of the same colors. While they can follow the included chart to create a specific marker, they can also just use the colors of their choosing and mix and match to see what they prefer to go together. Once they get their markers made, they can give the color whatever name they choose. They’ll be able to test out these color creations by using the pages with the markers. For more fun, the set also comes with Scratch and Sniff sticker pages. Kids can color these and enjoy both the scent and their unique color designs. Both parents and kids alike will be thrilled with the scents in the set. The colors are mostly the primary colors. These include colors like red, yellow and blue. The scent of the ink is a sweet fruit scent. Once kids pick which ink they want to use for their creations, all they have to do is mix the colors, then put the marker core into the ink, which is in the measuring tube. The core will then fill up with whatever ink color your child has created. When the core is done filling, all that’s needed is to take it out of the tube using the tweezers that are included. Then to finish off creating the marker, the child adds the cap, plug and tip for toy. There are a total of 16 different markers that your child can create and there are two boxes they can use for storing the markers. Included in the set is the marker snapping tool, the measuring tube, the tweezers and all the accessories needed to create the markers. Plus, you get one sheet of the Scratch and Sniff stickers, 2 sheets of blank stickers and the bottles of ink. All the instructions necessary to play and create with the set are included, and there are refill parts available with this set that come in different colors.